Summary (from the publisher) A GROWN-UP KIND OF PRETTY is a powerful saga of three generations of women, plagued by hardships and torn by a devastating secret, yet inextricably joined by the bonds of family. Fifteen-year-old Mosey Slocumb-spirited, sassy, and on the cusp of womanhood-is shaken when a small grave is unearthed in the backyard, and determined to figure out why it’s there. Liza, her stroke-ravaged mother, is haunted by choices she made as a teenager. But it is Jenny, Mosey’s strong and big-hearted grandmother, whose maternal love braids together the strands of the women’s shared past–and who will stop at nothing to defend their future. Why I liked it: There’s a lot of really good women’s fiction writers out there, but Joshilyn Jackson is in a league of her own. She has a knack for describing incredibly complex thoughts and feelings in a way that really connects readers with the characters. For a while there, I almost felt like I was Mosey. I hung on to the narrator’s every word as the story slowly unfolded, always teasing me with more questions than answers about Mosey’s sordid family history. The narrator: You’d think that authors would be ideal narrators, but typically their performances fall flat. They tend to sound like a bored librarian entertaining little kiddies at a story-time reading circle. But much to my surprise, Joshilyn Jackson did a standup job narrating this book. Her authentic Southern drawl really added to the characters’ personalities. There were quite a few characters in this book – which can be really confusing on audio – but she gave each of them a distinct tone. I really loved how she’d lower her voice a few octaves to drum up the suspense. Really well done! Favorite character: There’s a lot of fascinating characters in this story, but Big (aka Ginny Slocumb) really stole my heart. She is everything a mother should be: Protective, loving and self-sacrificing. I loved how she stopped at nothing to rehabilitate her daughter in defiance of naysayers who swore she’d be a vegetable for the rest of her life. She’s headstrong, feisty and incredibly smart. I especially enjoyed how she handled her family’s tormenter toward the end of the book. Well played, Big! Summed up in three words: Mesmerizing. Heart wrenching. Poetic. 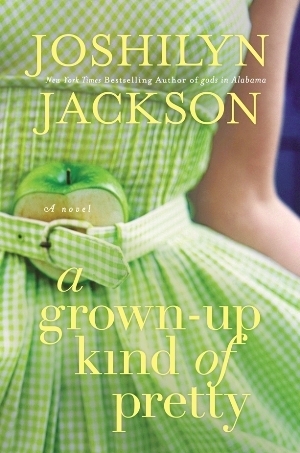 Posted on May 4, 2013 by Bubble Bubble Books and Trouble •	This entry was posted in Tear Jerkers and tagged A Grown-Up Kind of Pretty, Joshilyn Jackson, southern chick lit, Southern fiction. Bookmark the permalink.